A woman has been arrested after a man was stabbed in a town centre. 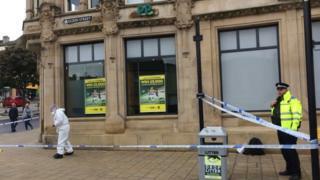 Police received reports of someone in Barnsley town centre with a knife at about 08:20 BST. The man suffered minor injuries and a woman, 28, was arrested on suspicion of attempted murder. South Yorkshire Police has since recovered a knife. The force said an investigation was under way to establish whether it was "an isolated incident and whether the individual acted alone". Police said the woman remained in custody and was "currently being assessed from a mental health perspective". Earlier South Yorkshire Police had been receiving support from counter-terrorism officers. Market trader Abdul Razzaq, 43, said he confronted a woman after she produced "a huge kitchen knife" and shouted "kill" repeatedly as she stabbed one man in the shoulder and then walked around the busy streets. He said she had taken the knife out of its wrapping and put the packaging in a bin near his stall. Mr Razzaq described how he then followed the woman around the town centre as shoppers moved out of her way. He said he convinced her to put down the knife before police officers made the arrest. "People were scared. They were really scared," he added. Image caption Abdul Razzaq said he confronted a woman after she produced "a huge kitchen knife"
Earlier, police said there would be a "high visibility police presence" in the town centre and asked people to remain vigilant. Assistant Chief Constable Tim Forber said: "We understand this morning's incident will have been distressing and shocking for those in the town centre," he added. "We are working to piece together what happened." He said the force was "keeping an open mind as to the motivation". Police cordons remain in place and there has been activity around a bin inside a cordon in Peel Square near a newsagent. A number of shops closed during the initial police response. Hannah Fuller, 24, a member of staff at the Subway sandwich shop at the Barnsley Interchange, said officers had arrived at the bus and train station at about 08:00. She said officers rushed towards the railway platform and added: "We had to close for an hour, Peel Street was closed." A Travel South Yorkshire spokesperson said the station was open as usual and there were no reported delays to trains or coaches.